Using the proper bonsai tools is essential to getting the best results when creating your work of art. Bonsai is growing in popularity, and more and more people are becoming interested in this ancient art form. As with any hobby, there are dozens of 'add-ons' and accessories that you can purchase to help improve your skill and make tasks easier. As a beginner, there are a few necessary tools that you must have in order to ensure success. And, although it may cost a little more, it is important to buy good quality equipment that will give you clean, sharp cuts while causing as little damage as possible to your tree or plant. Most Bonsai artists will tell you that this is the most important bonsai tool to purchase. Shaped like a pair of pliers, this cutter is very sharp for clean, precise clipping. It is designed to remove or crop branches while leaving a concave wound that causes less damage and allows for rapid healing. This helps minimize scaring, and often it is difficult to tell that a branch was removed. The concave cutter is available in different sizes, but the 8 inch is the most common. This looks very similar to the concave branch cutter, but it has a spherical shaped head, forming an open circle. The rounded blade is designed for creating a hallowed out wound that will heal flush with the branch or trunk for minimal scaring. This tool can be used to finish cuts made by a regular branch cutter, and is also good for pruning roots and removing knobs or bumps from branches and trunks. Bonsai often requires wiring the branches and trunk to create or “train” the desired position and shape. A regular wire cutter may be used when applying the training wire; however, it is best to use a special bonsai tool when removing the wire. Bonsai wire cutters have very short cutting blades and a rounded head that allows you to cut right next to the bark without leaving marks or causing damage. 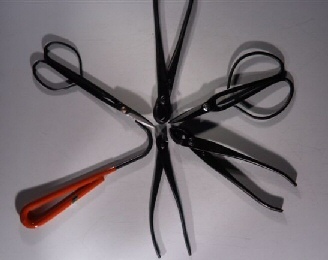 These look similar to surgical scissors with very short, sharp blades, long handles, and small finger holes for precision and control. Bud scissors are used for trimming leaves, buds, and small branches from your bonsai. They are especially helpful when working with smaller specimens and are ideal for fine details and delicate work. This tool looks very similar to the knob cutter and works basically the same way. In fact, if you are a beginner, you can use your knob cutter to prune your bonsai roots and add the root cutter to your tool kit at a later date. This tool is a simple handle with a short bent hook or prong, and is very helpful when potting or re-potting your bonsai. When moving your tree from one container to another, the root hook is used to loosen and remove the soil, dislodge the roots, and untangle any root clumps. It is available in single or multi-pronged versions, although it is easier to cause damage when using the multiple-point tool. While the above list includes the basic bonsai equipment, there are some accessories that can be added to your tool box to help make certain tasks easier and more efficient. This bonsai tool is used to gradually bend bonsai trunks or branches that are too thick for training wire. Basically, it is a clamp-like device that is attached around a limb or trunk. A tightening bolt applies pressure, which can be increased in small increments over time, slowly causing the desired bend or curve. Generally, this tool is about 8-9 inches in length with three rake-like prongs on one end and a flat tamping spatula on the other end. Like the root hook, the rake can be used to untangle roots or remove soil before pruning and potting. However, it is also useful for removing debris or weeds, and for stirring and aerating the soil to help the bonsai receive food and water more efficiently. The spatula end is helpful when digging out roots or tamping down soil after replanting. Typically, these look like a regular pair of tweezers, although some have bent tips or grip points on the ends to provide a secure hold. This tool is most commonly used to pull dead needles from pine trees, but tweezers are also helpful in removing insects, weeds, fine debris, and unwanted buds, or dead foliage from your bonsai. These small saws are used for removing branches from your bonsai, although they are usually reserved only for those limbs that are too thick for any type or size of branch cutter. A folding saw resembles a pocket knife, while a pruning saw looks like a steak knife. Both have very fine serrated-edged blades that narrow to a small tip. Some bonsai artists also say that these saws are useful for pruning branches inside the tree. This is a general purpose tool that is used when trimming branches or twigs and removing leaves or shoots from your bonsai. They are very useful in helping you create the desired shape for your tree. These are the main tools used in the art of Bonsai, however, there are many, many more specialized pieces of equipment that are designed for shaping, carving, replanting, and growing the various styles and forms of bonsai. For the casual hobbyist, the basics are generally sufficient for any tasks required. But, for the committed Bonsai enthusiast, there are dozens of tools that can make tasks easier and help give substance to your unlimited imagination.